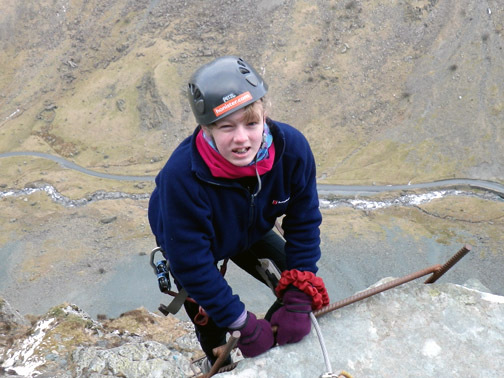 " Honister's Via Ferrata Extreme "
Date & start time: 12th March 2013, midday start. 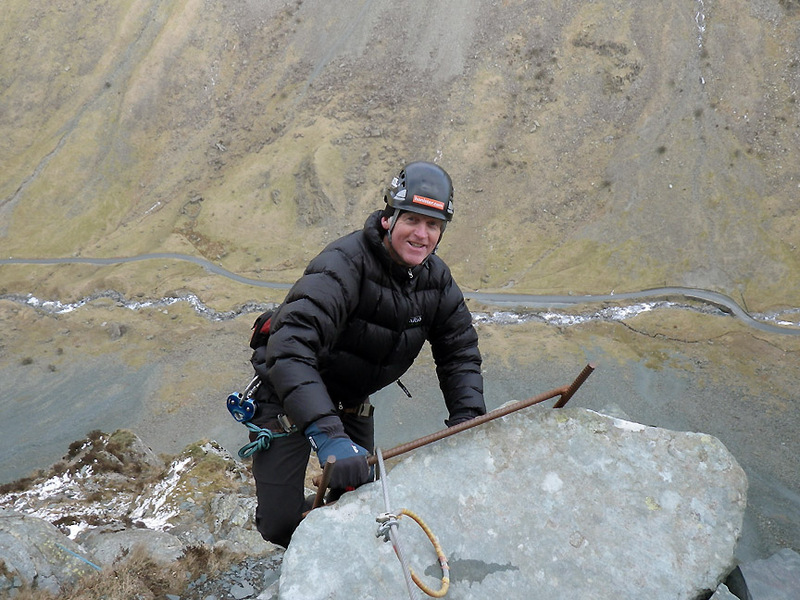 Places visited : Honister Hause, Bull Crags, Ash Crags, Black Star summit and back. 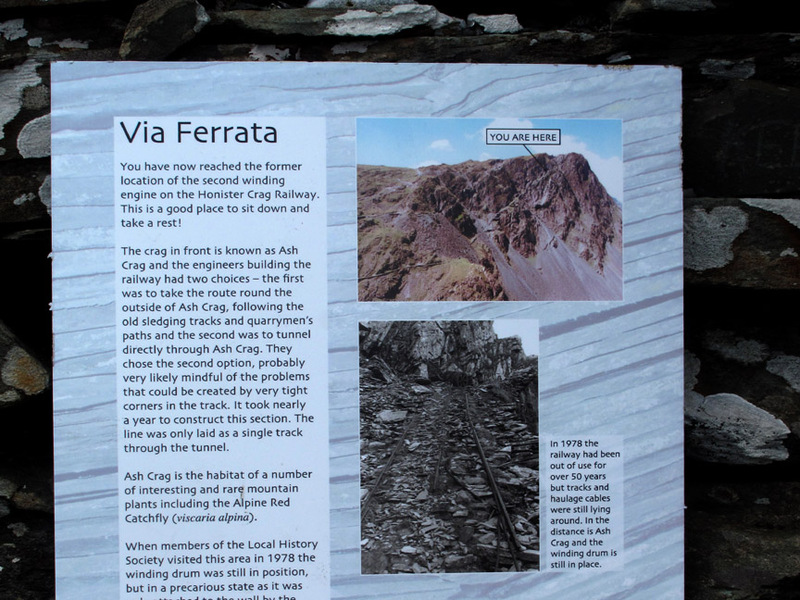 Walk details : 2.2 mls, 1200 ft of ascent, 3 hours. 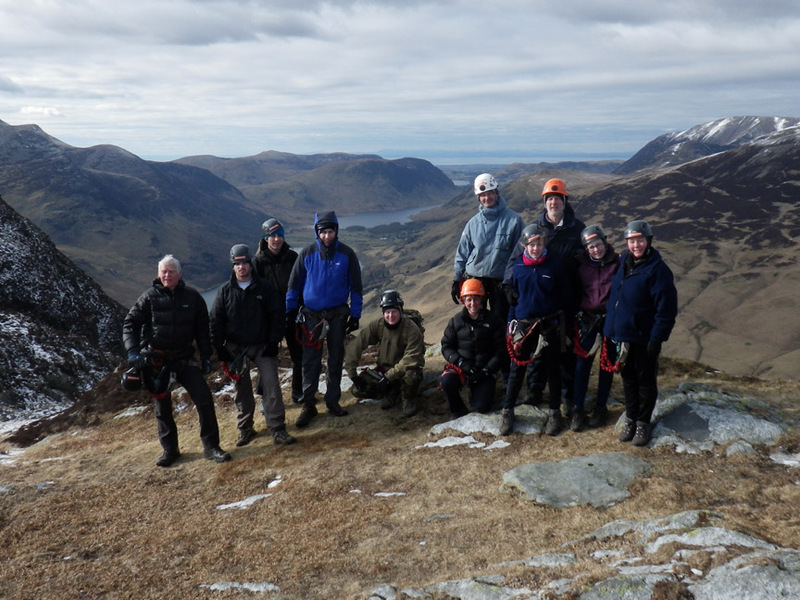 Highest point : Black Star (part of Fleetwith Pike) 2060 ft - 634 m.
Walked with : Ann and other members of the public, Paul and Becky from Honister Mines. 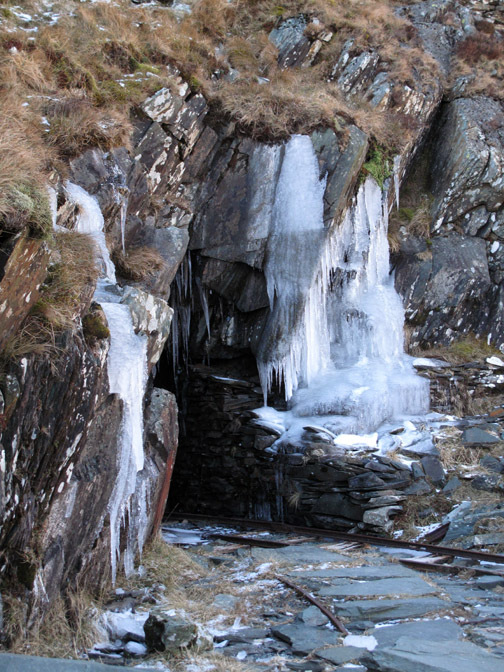 Weather : Great winter weather, snow on the fells, blue skies above but a cold breeze. 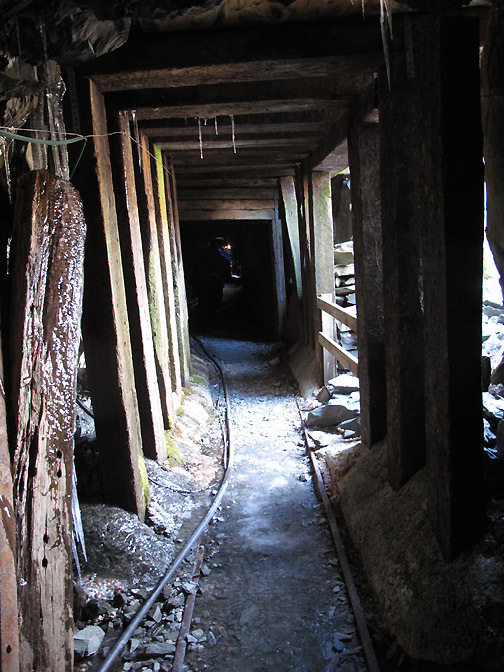 It's " Residents Week "
and invites them up to experience what the mine has to offer. 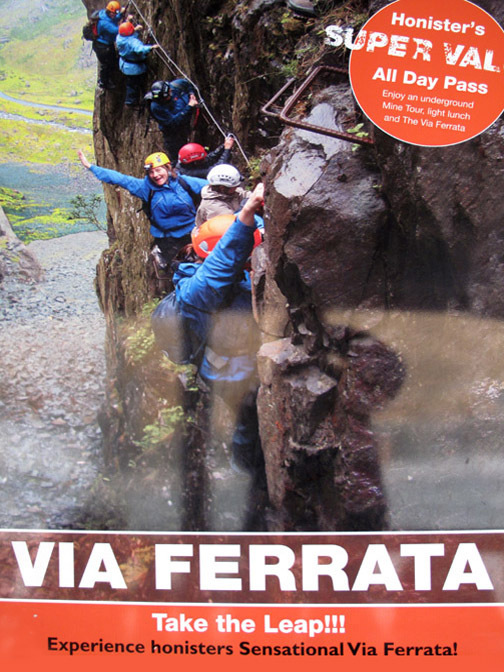 and had a go at the Via Ferrata Extreme. Would it live up to expectations . . . I'll tell you once we've launched ourselves over the edge. 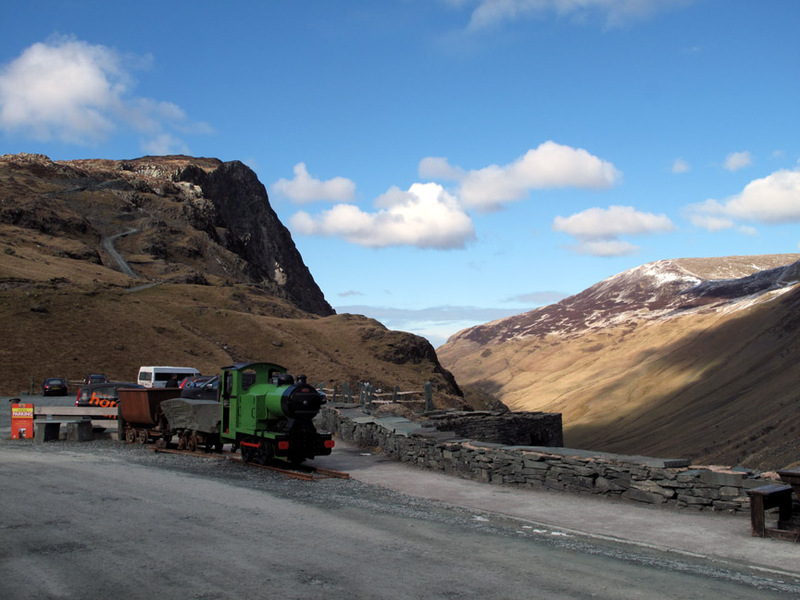 and we find ourselves at Honister for a midday appointment . 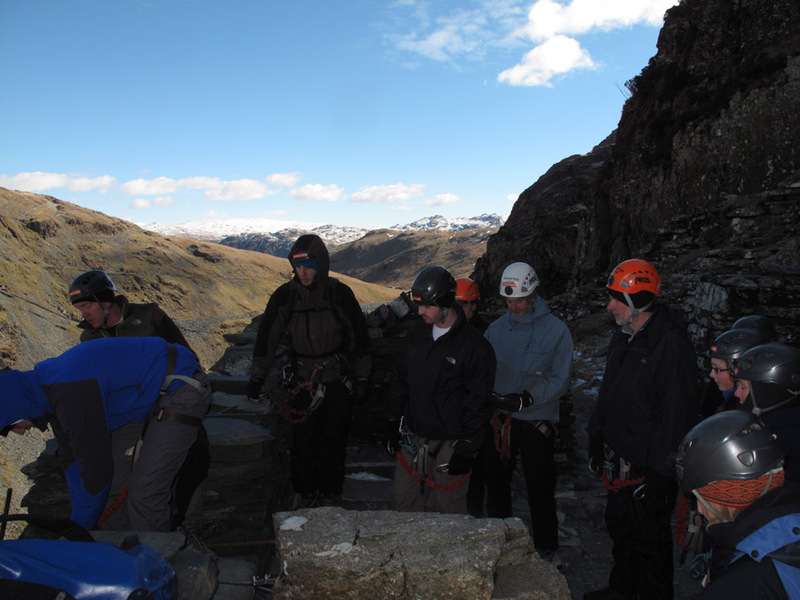 . . to join a party of twelve on an adventure across the crags. 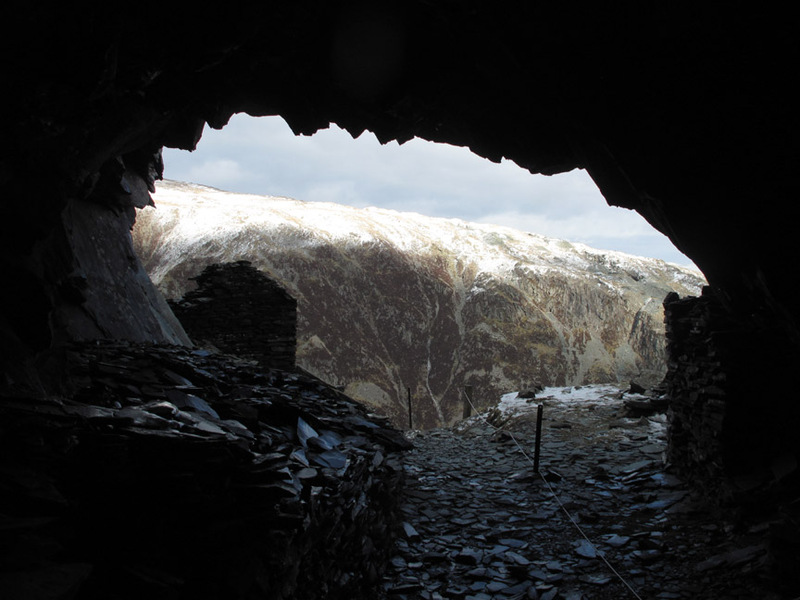 Let's not forget that Honister is also a working Slate Mine, the last working mine of its type in England. 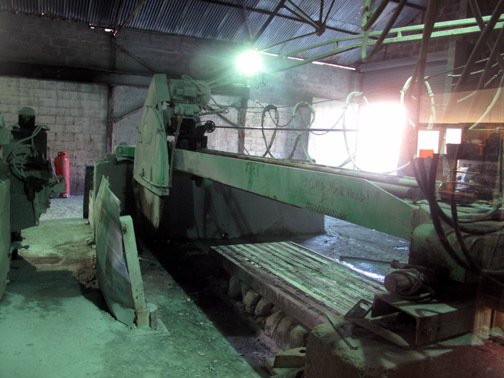 which are used it initially prepare the slate blocks prior to splitting and finishing. 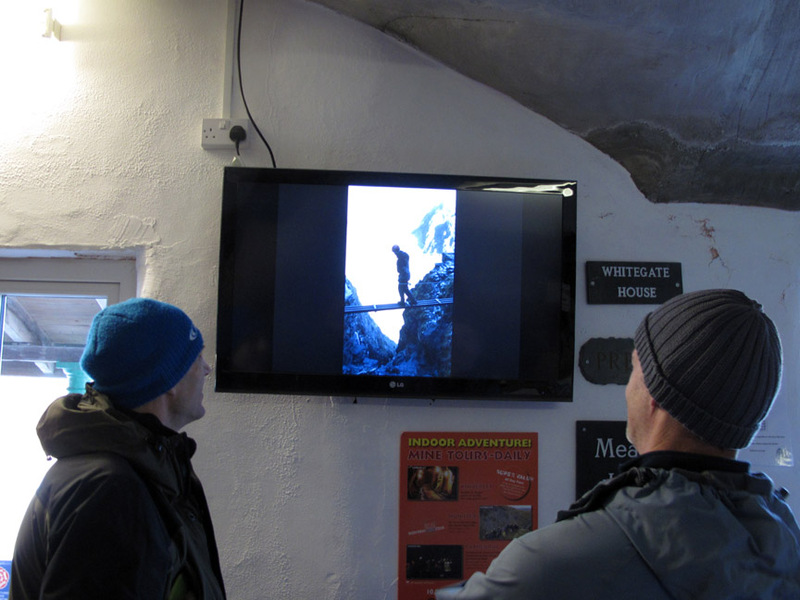 where pictures of earlier climbs are being shown . . . this could be us . . . in just a short period of time ! 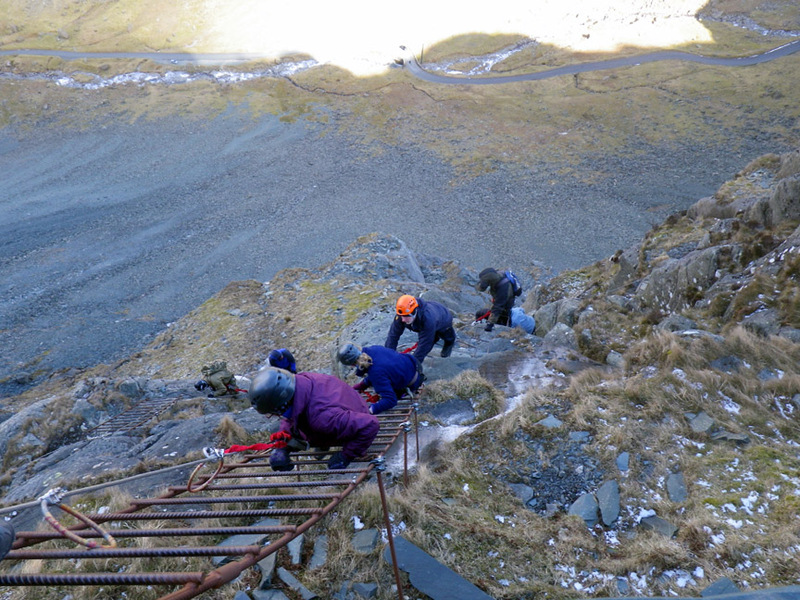 After collecting our harnesses and hard hats we step outside. 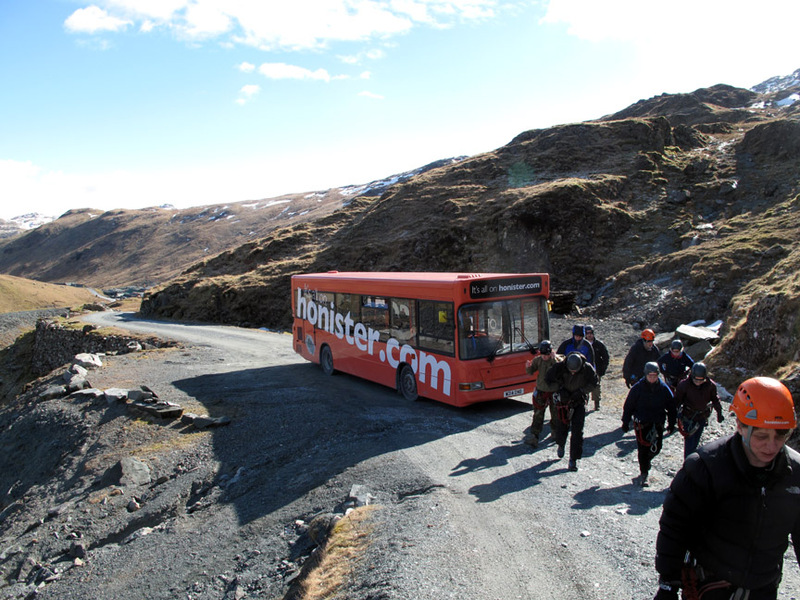 Time to catch the bus on a most unusual bus route . 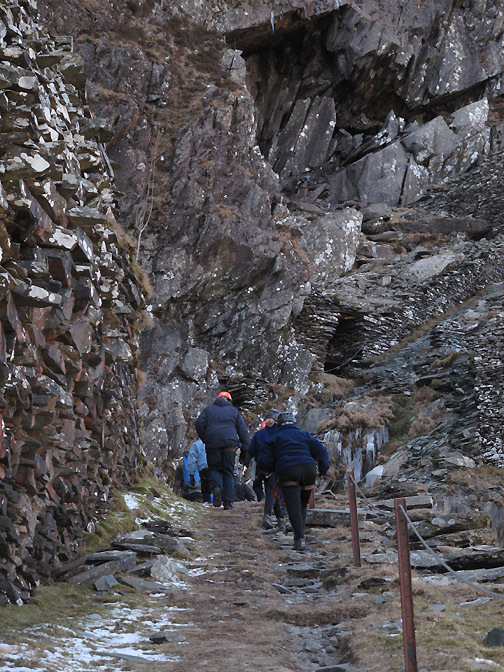 . . up the mine roads to the entrance high on Honister cliffs. The end of the road . . . all change for this trip of a lifetime. 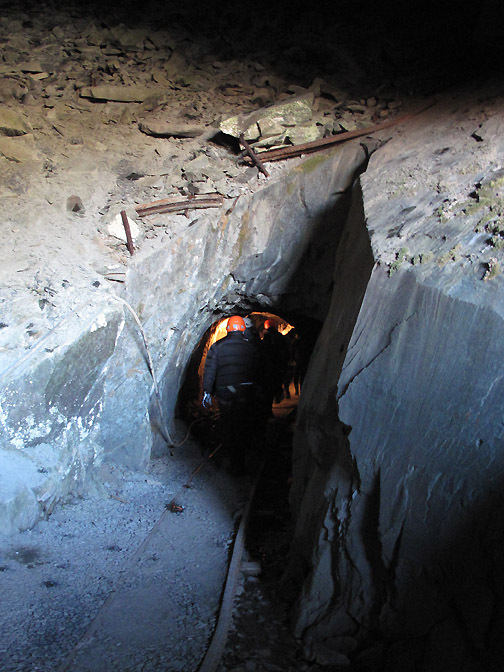 We start by entering the mine using one of the old entrances . 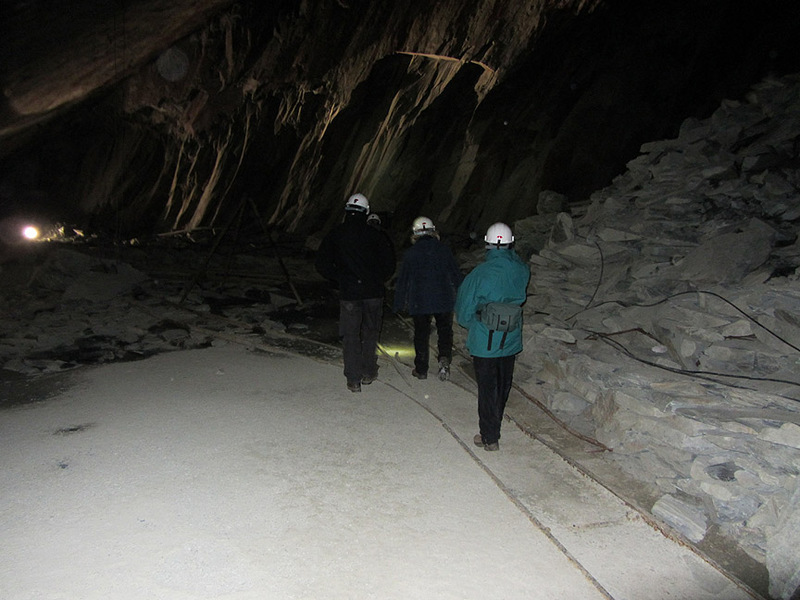 . . and make our way through the tunnels inside the hill. 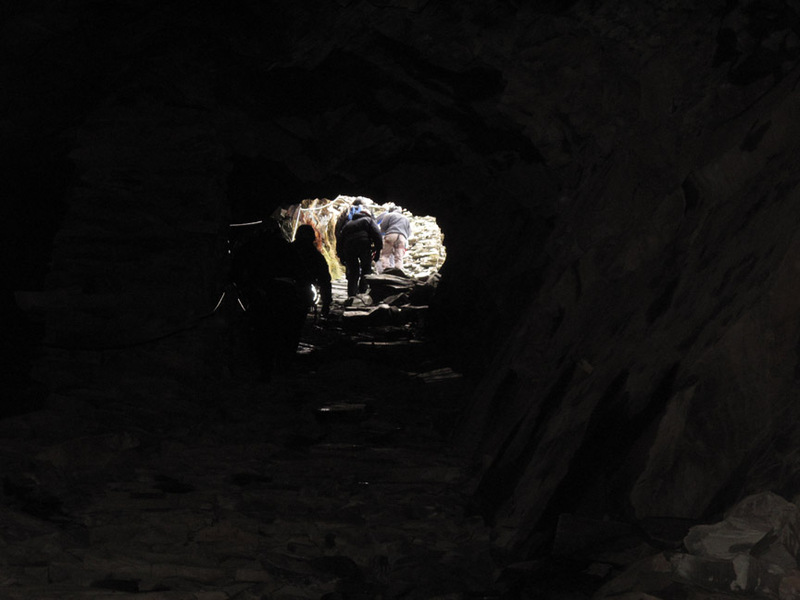 Following the old miners trails through the mine . . .
. . . sometimes relying on the mine lamps to light the way. 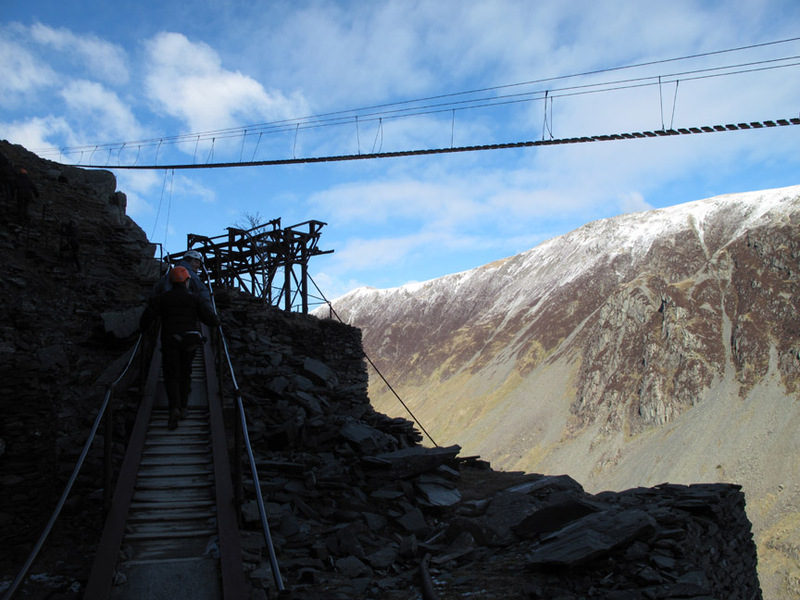 We emerge into the sunshine again at the pylon that used to carry an aerial ropeway across the face of the fell. 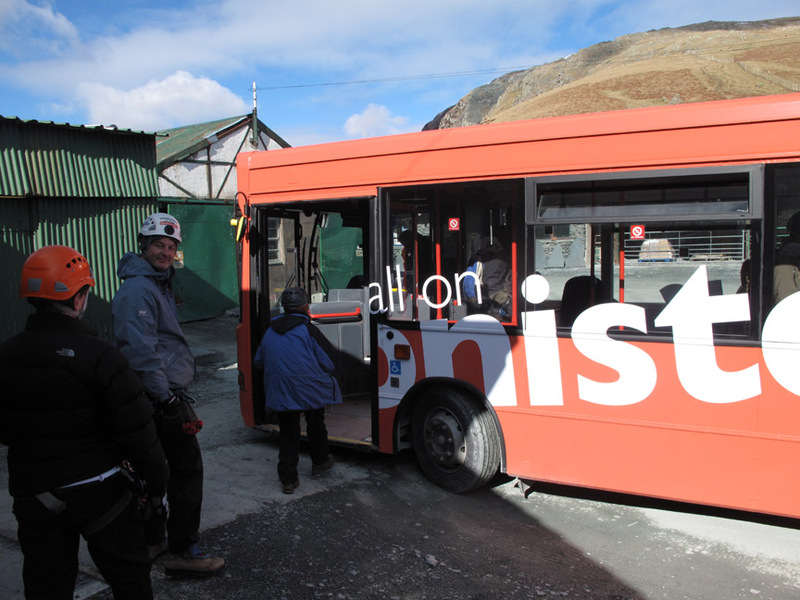 It was used to carry the slate down to the mine complex where it would be cleaned and dressed. 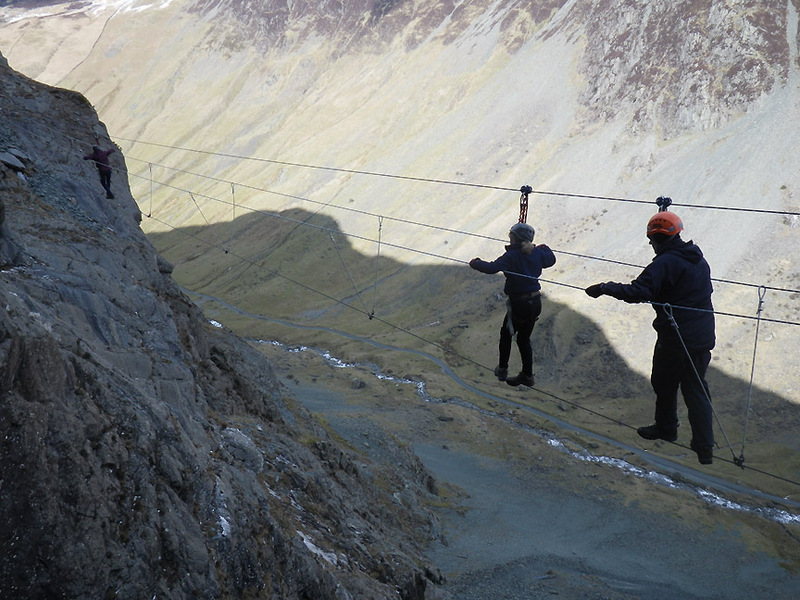 High above is a new wire bridge, soon to be part of the new " Discover Honister Mine Trip "
Looking back at our steel bridge and the new high-wire " Infinity Bridge "
Did I say it was cold today ? . . . Check out the icicles ! You Are Here . . .
. . . and guide Paul pointed out . . . " soon you'll be there !" 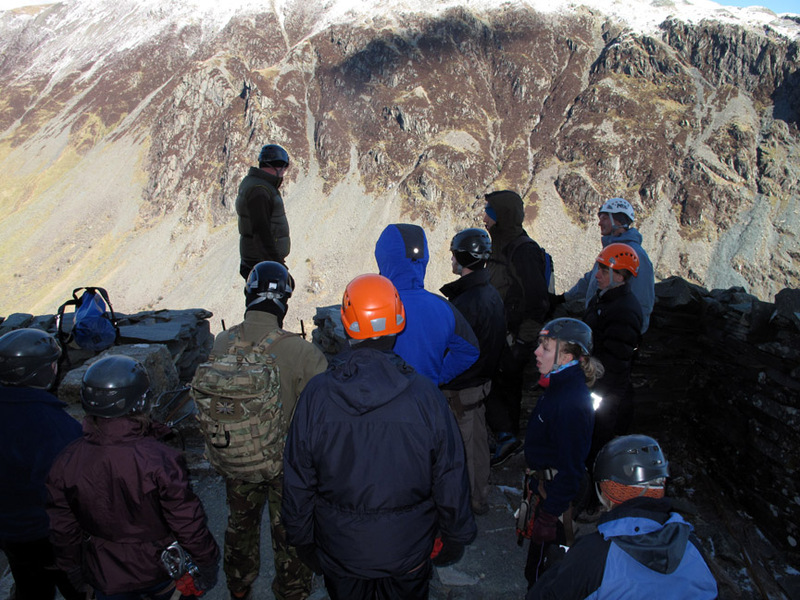 A last safety briefing about equipment and routines and we were off. First man away . 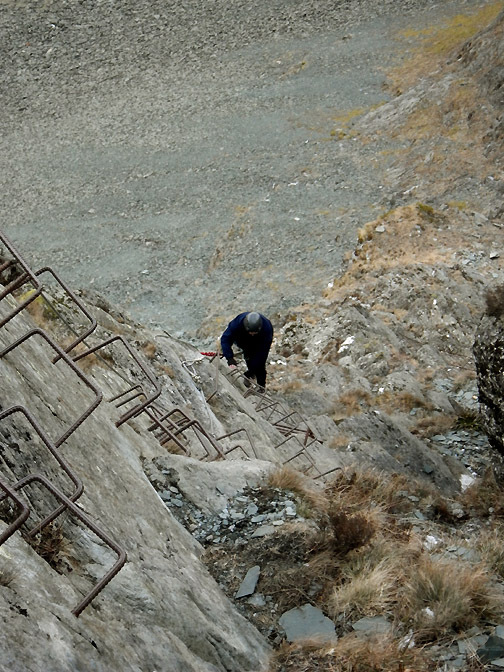 . . down the ladder and down the cliff face . . . at an impossibly steep angle. Number two away . 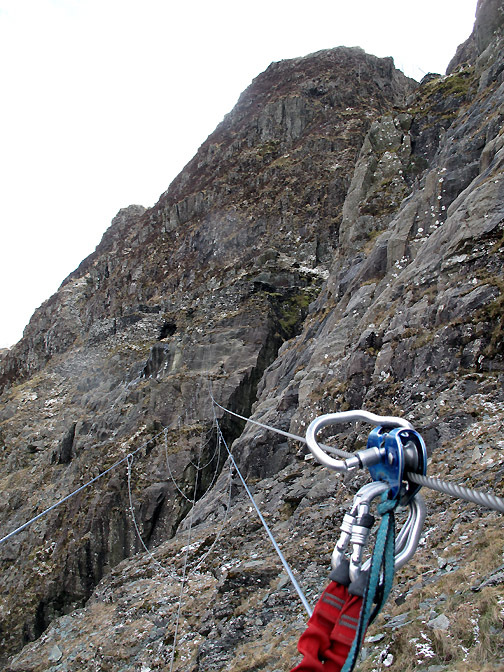 . . clipping onto the red loops as he descends. We're well under way now. 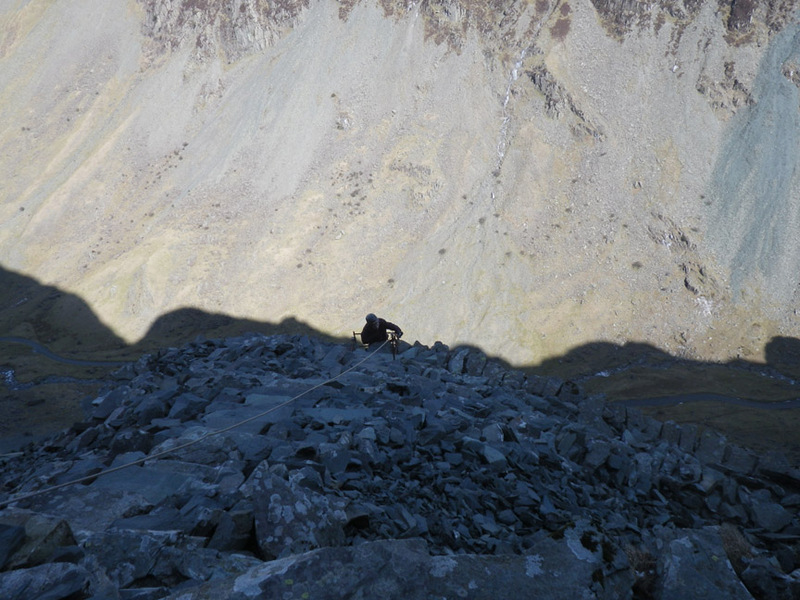 Following the trail across the cliff face . . . moving the two protective carabinas in sequence as we go. 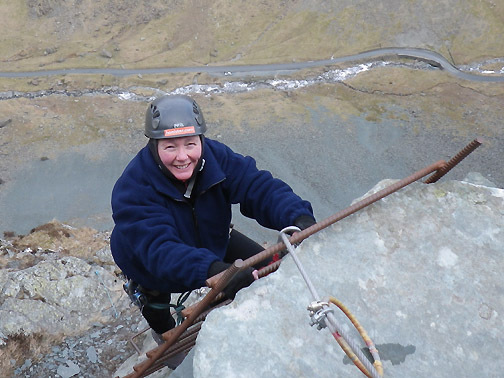 Don't look down unless you've a good head for heights. It is probably about 600 feet straight down to the roadway below. 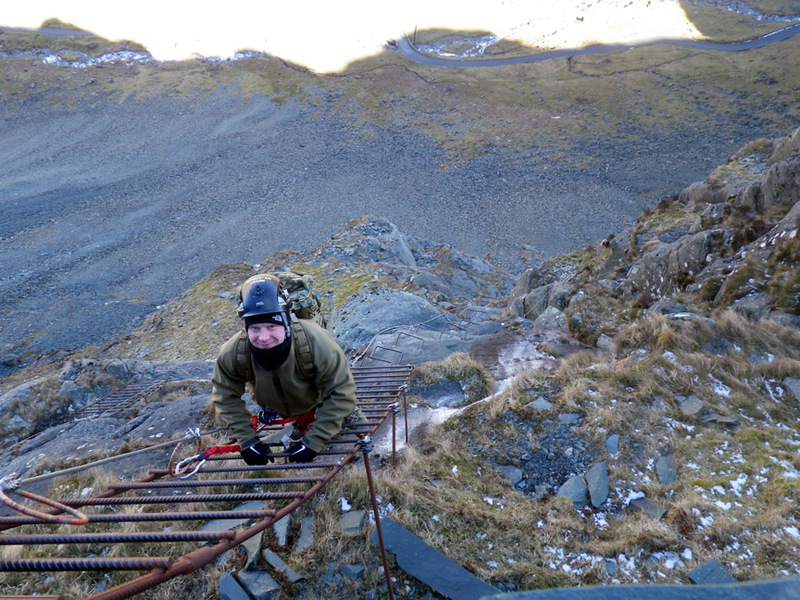 That's me climbing "The Extreme "
Respite as we join the old railway track for the next part of the climb. 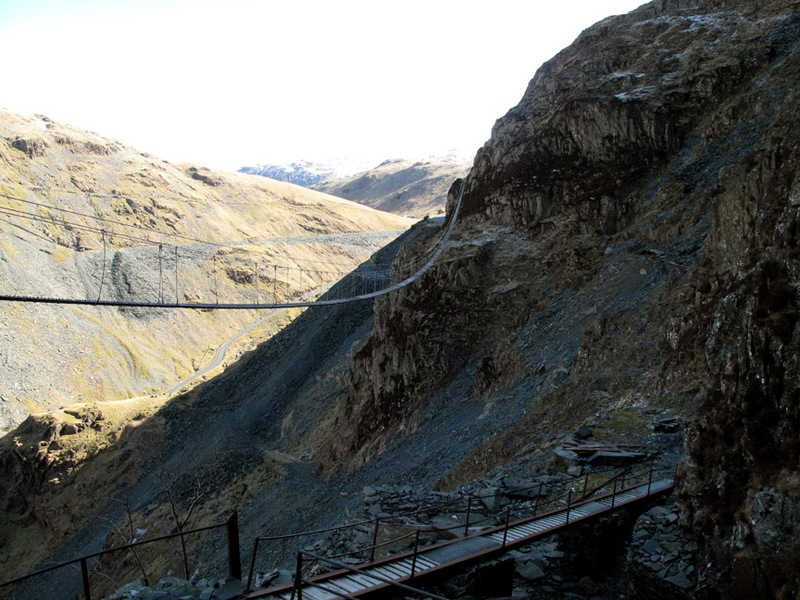 Across the bridge the original Via Ferrata route continues on up the crags.
" 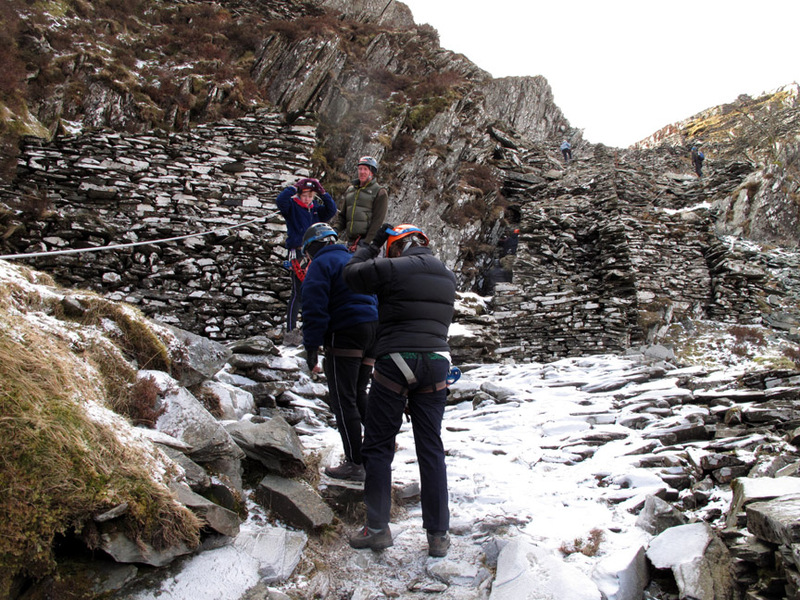 Over there you can see the old Yew Crag Quarries " . . . says Paul. 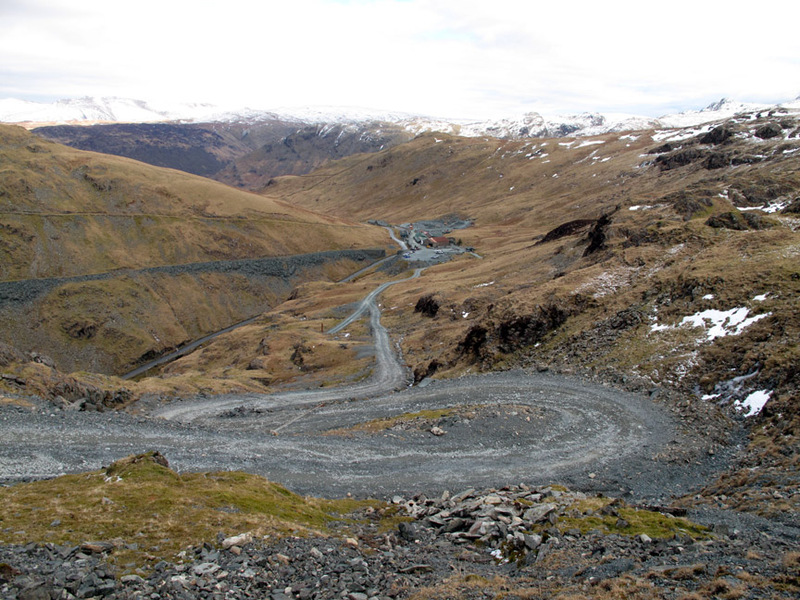 we could see the tracks and spoil heaps of more old workings on the other side of the valley. But we are heading down The Extreme. 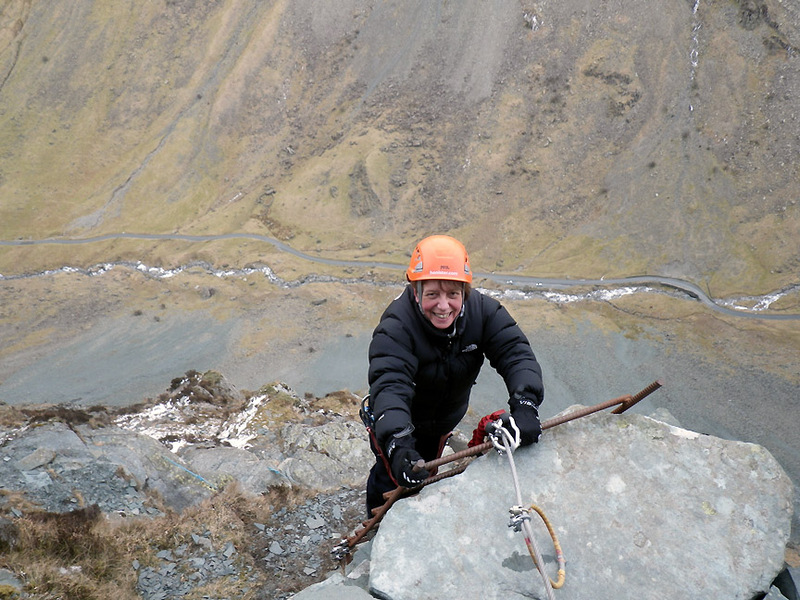 . . over the edge again ! Follow the leader down the iron steps. 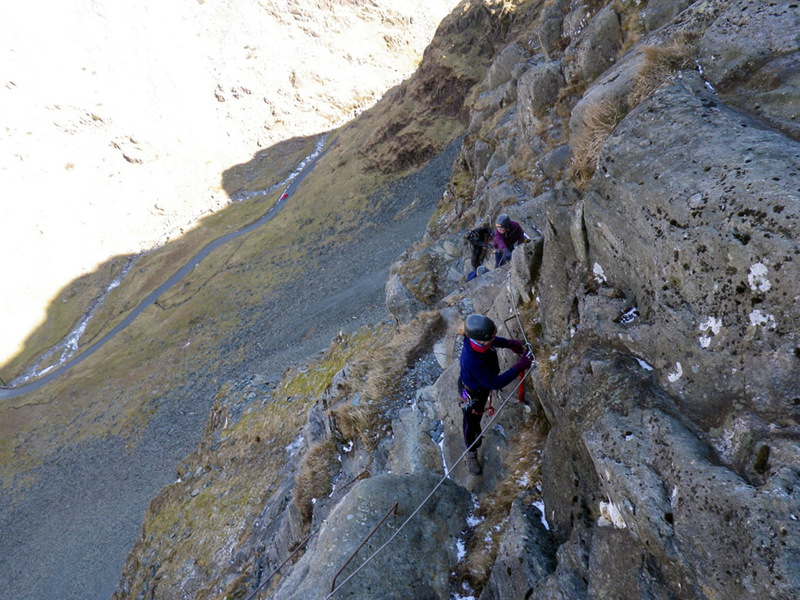 This is the gully beneath Bull Crags . 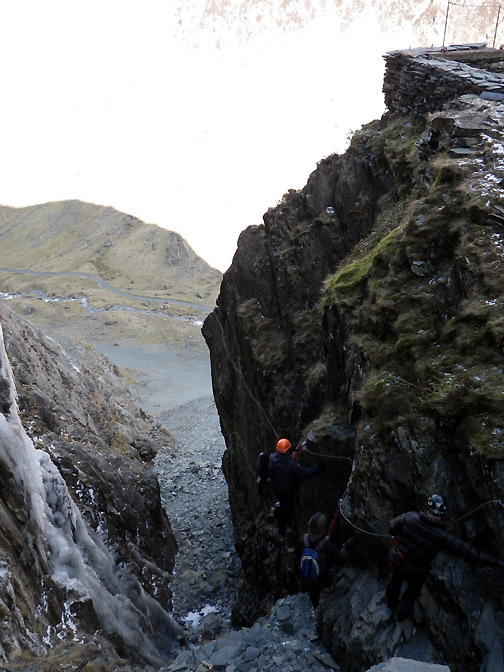 . . an "overhanging descent" and then a horizontal traverse across the cliff face. 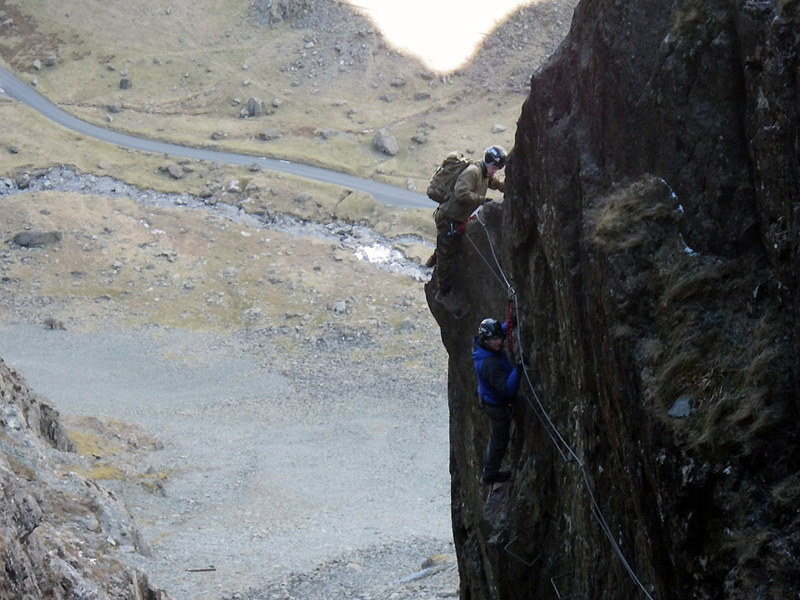 The leaders tackle the exposed " reach-around-the-corner ". I bring up the rear of the party . . . the main group are well ahead. Next is the Burma Bridge Crossing ! 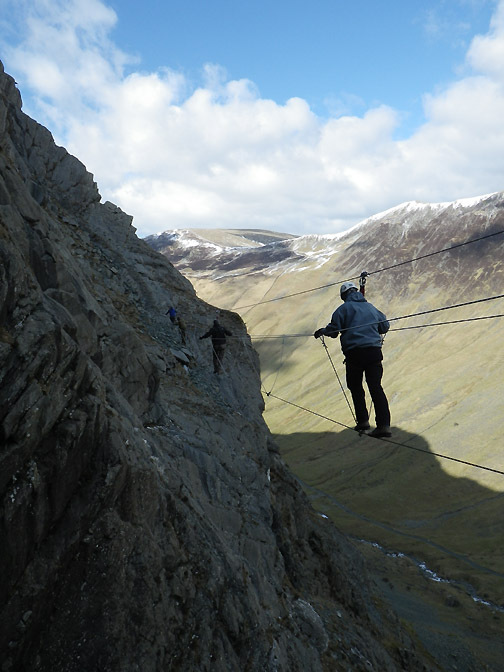 Our harnesses clipped this time to a pulley system on the safety wire . . . and we set off across the void. 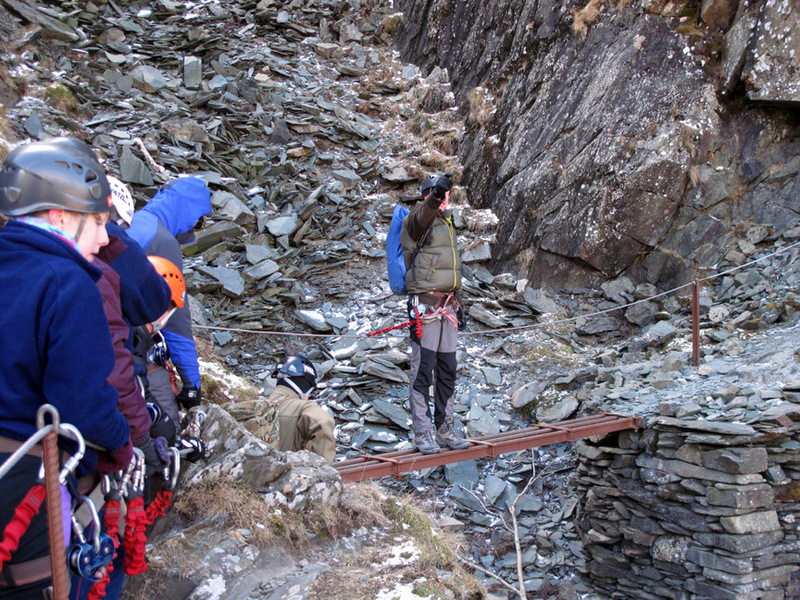 Looking back at the crossing successfully completed . 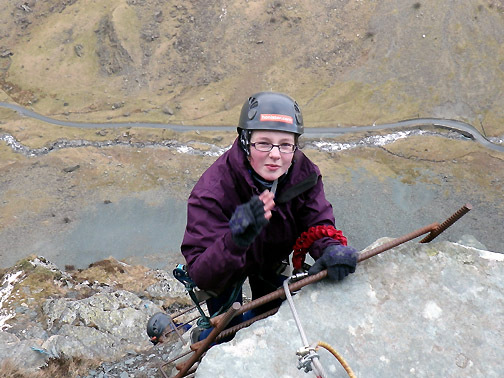 A steep pull up the rungs now, gaining height rapidly. The next challenge . 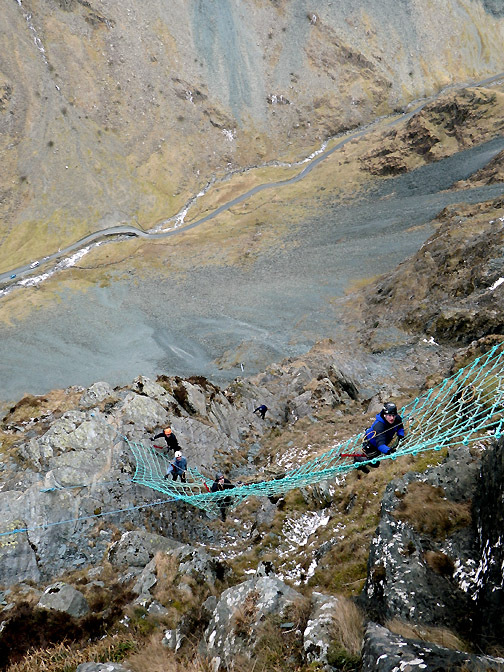 . . the Cargo Net. 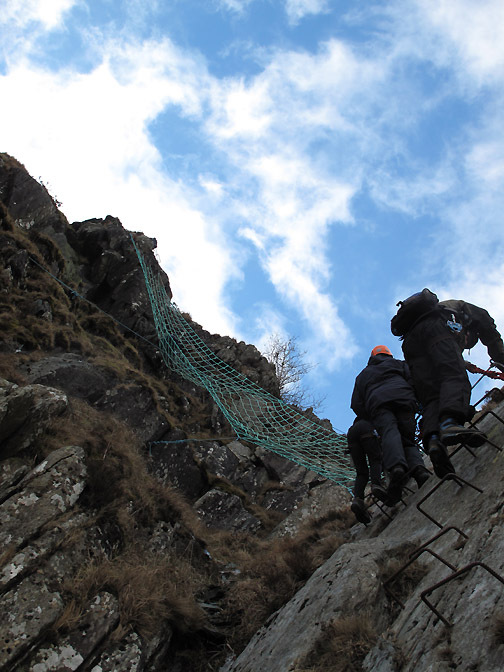 A moving part of the climb . . . literally moving in three dimensions. Paul does a photo shoot as everyone emerges from the ladder above the net. Daughter one . . . Daughter two . . .
. . . and Dad safely up. Bringing up the rear again . . . not exactly anywhere to overtake along the way . . .
and who wants to as we savour the whole experience. 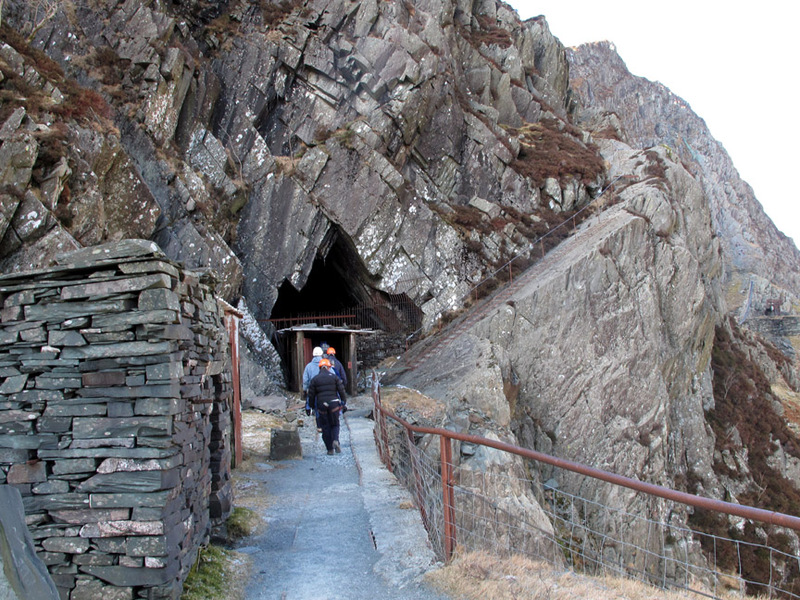 but later miners made a tunnel to make it easier to transport the stone down through the mine complex to the buildings below. 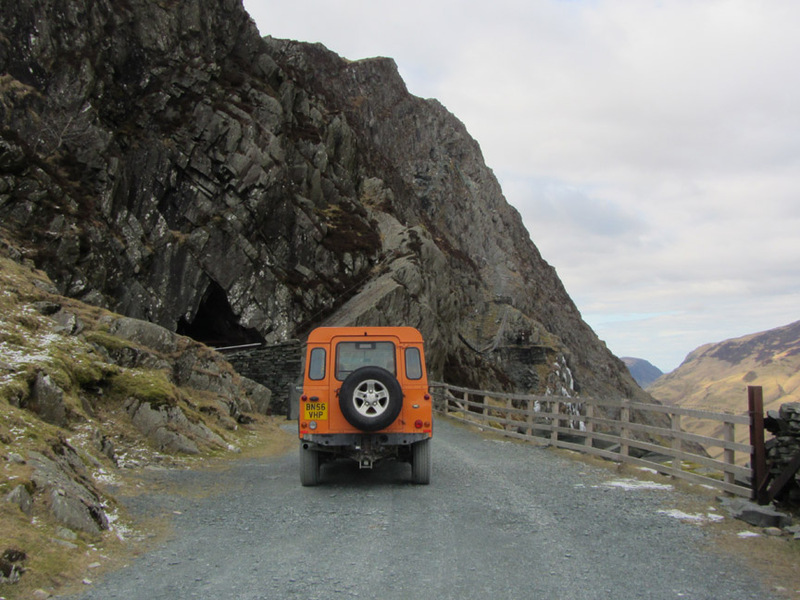 Looking back as we enter the tunnel. Torches on for the climb up through the incline . . . towards daylight once again. Up here it is a different world . 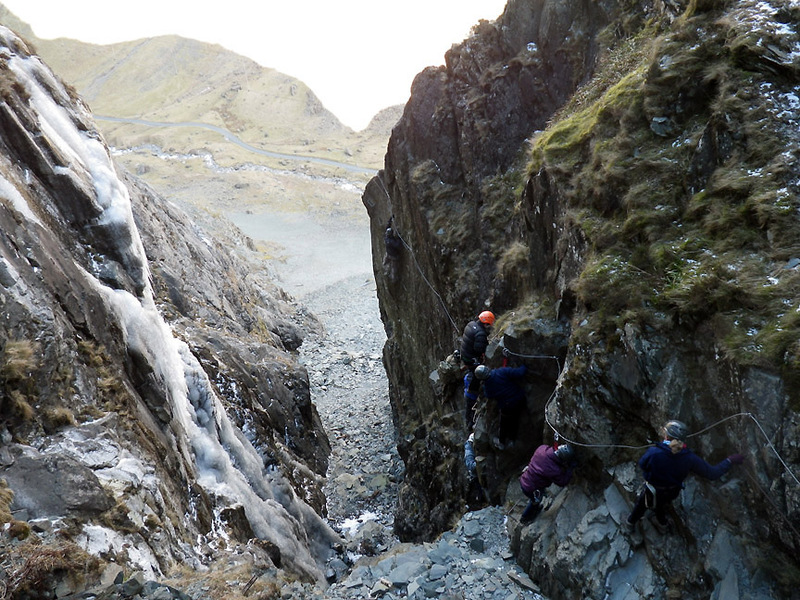 . . we have snow and ice to contend with as well. 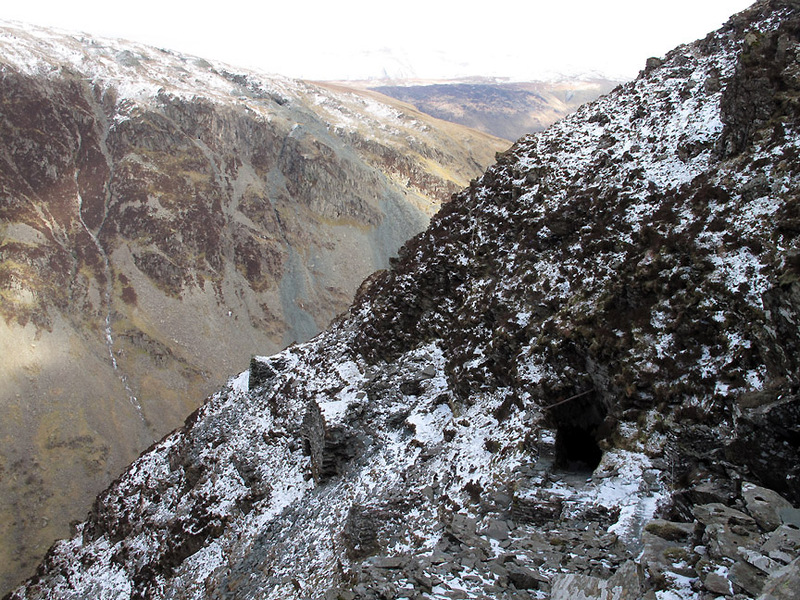 Looking down on the Ash Crag tunnel . 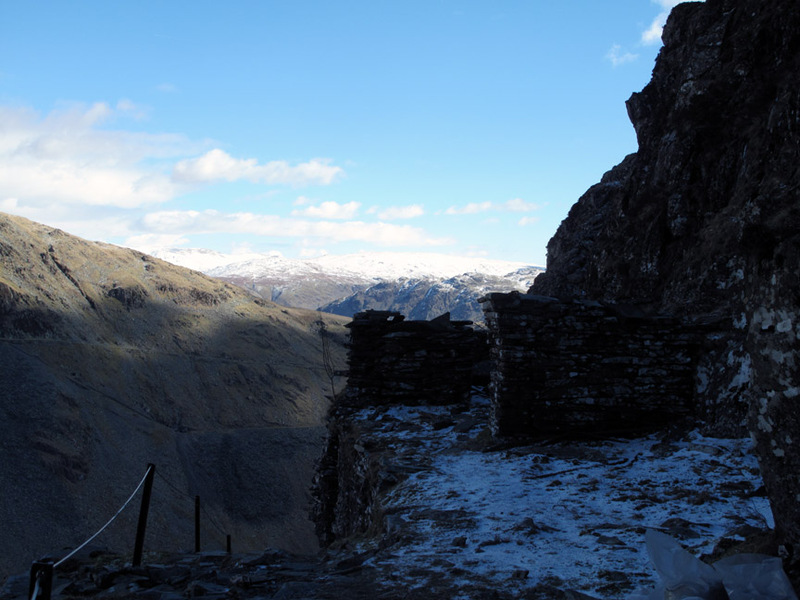 . . stone buttresses from the old track can still be seen out to the left. 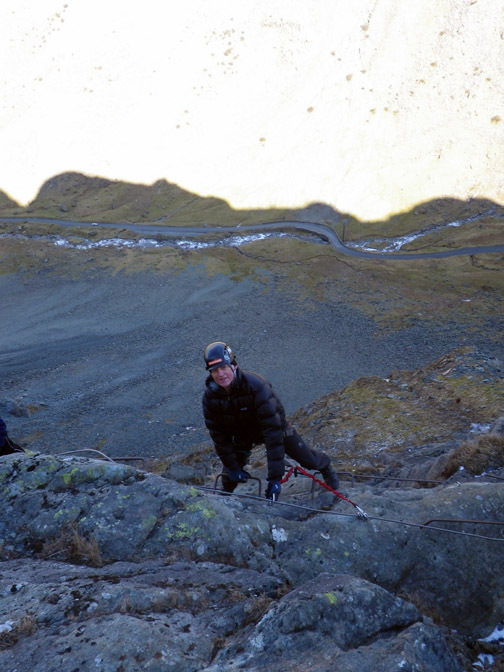 We complete the Via Ferrata at the Black Star summit. 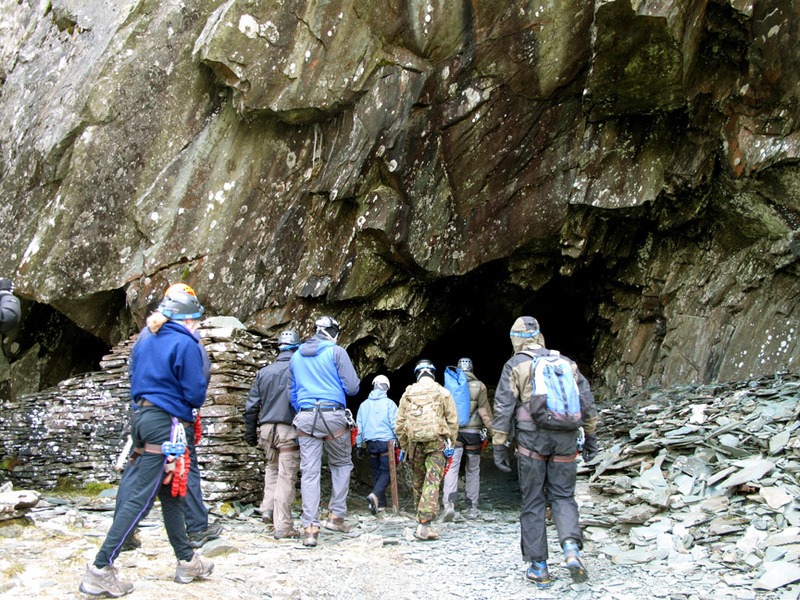 A great climb following the miners of old and experiencing some of the sights they would have seen over the last 400 years of the mine. 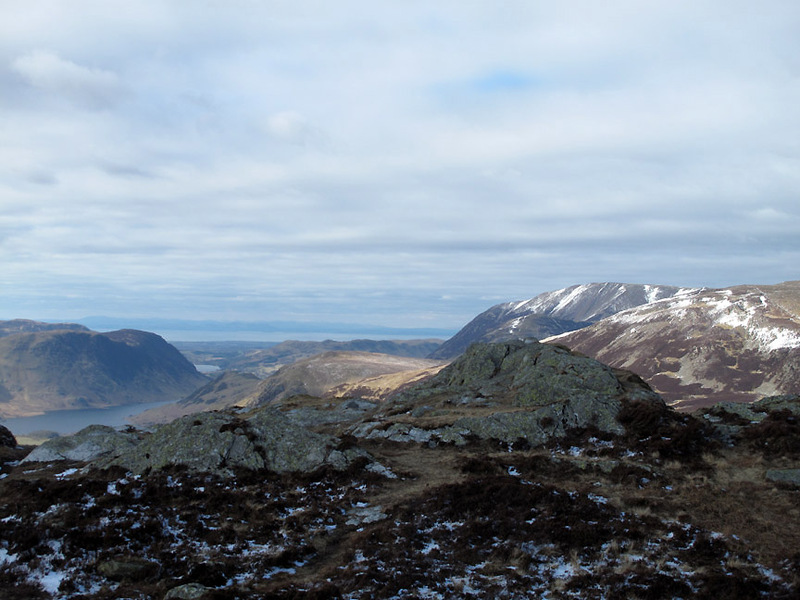 From the top we could now look down on Buttermere, Crummock Water, Loweswater and "salt water"
Beyond that salt water, the Solway Estuary, are the snow covered hills of Scotland. On such a fine day as this we take time out to look around. 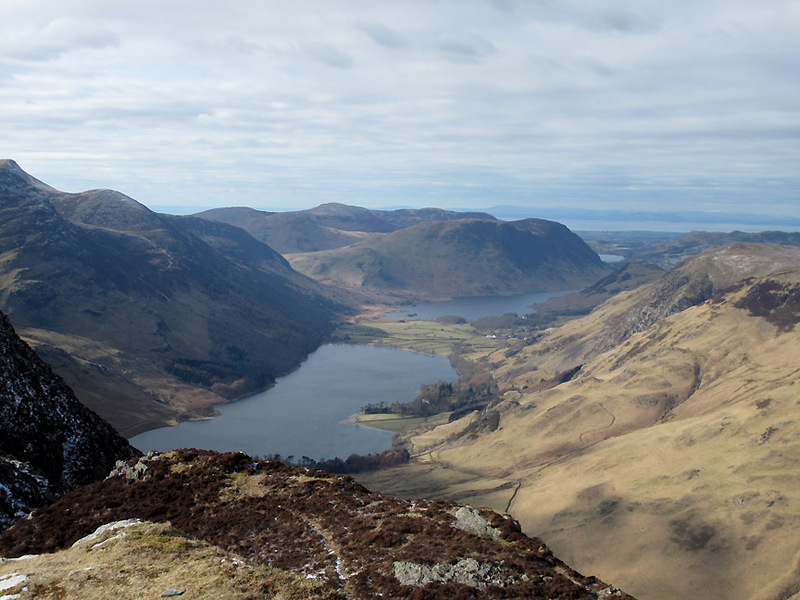 Click here or on the photo above for a Loweswatercam 360 degree annotated panorama and you can enjoy the view too. Before we go . . . a group photo on the summit. Thanks to Paul for all the photos that I was not able to take. 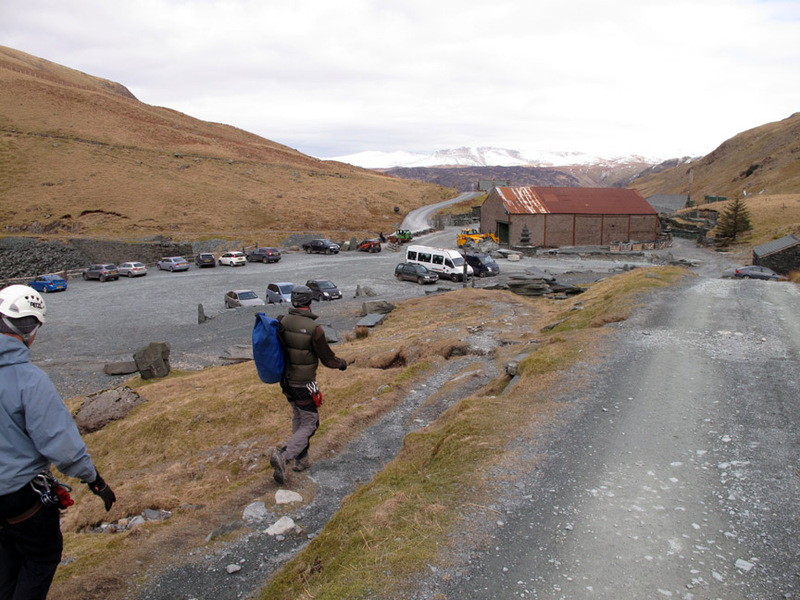 All that remained was the sociable walk back down from the top of the fell. 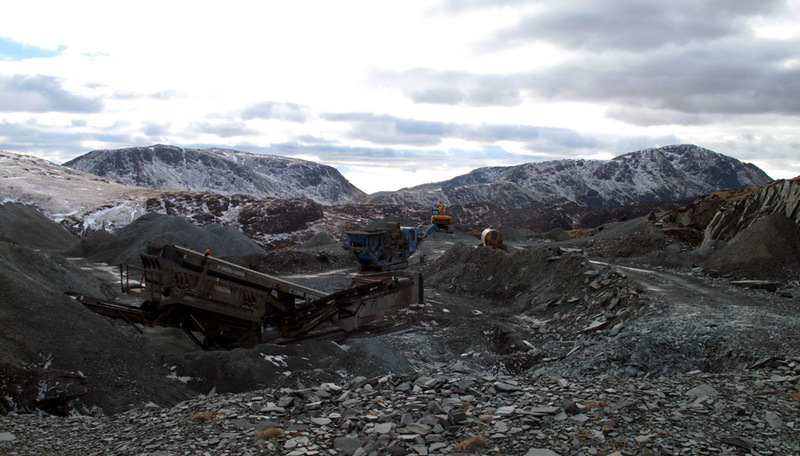 Here we pass the crushing plant in one of the open quarries on the southern side of the fell. The long and winding road . . . which in practice was over all too soon. 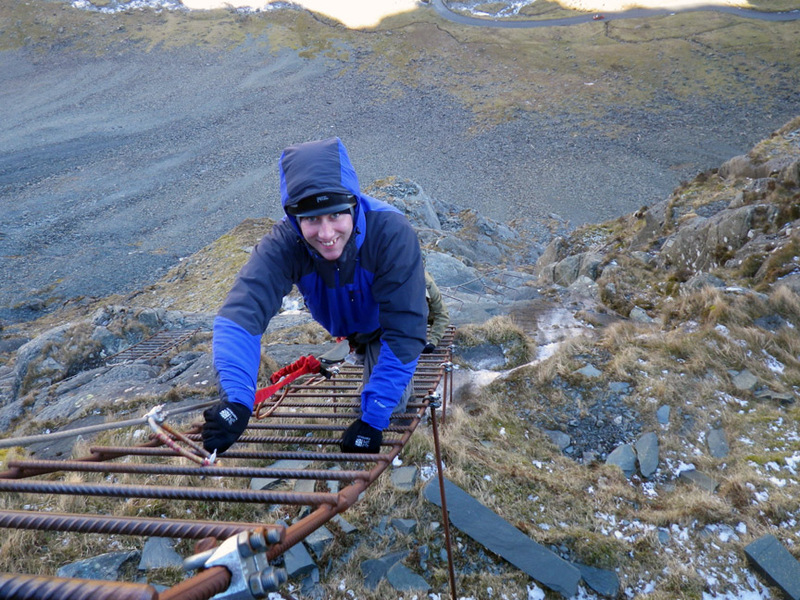 Paul leads us back down to the car park at the end of the trip . . . time for a drink in the cafe I think. 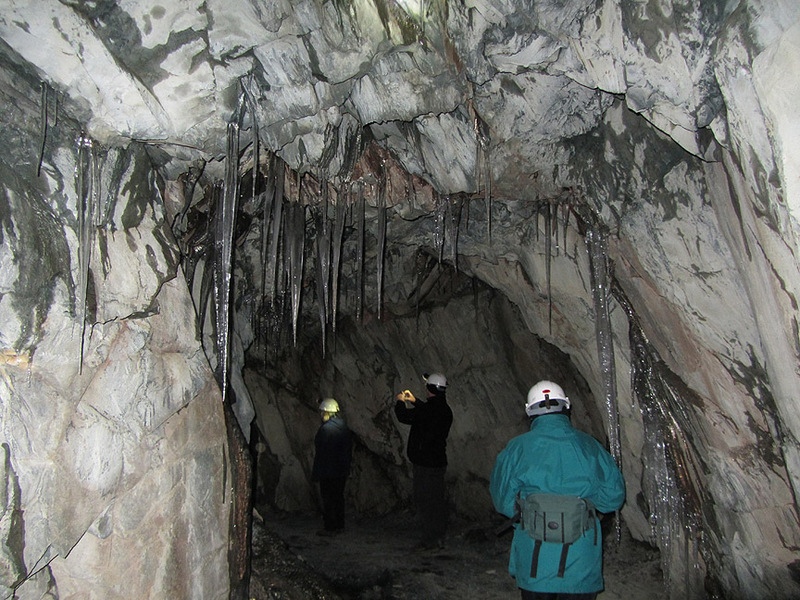 We were also able to have a taster of the Honister Mine tours with a trip deeper underground. 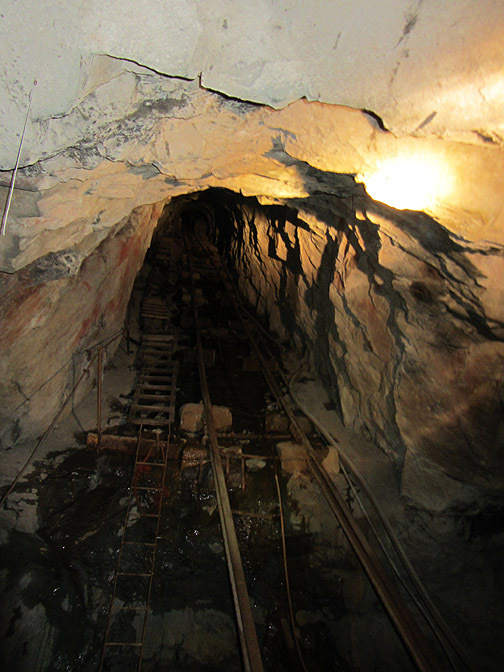 Using the same entrance as for the Via Ferratas you can explore deeper into the mine itself. Far away from the weather, from the blue skies and the sunshine . 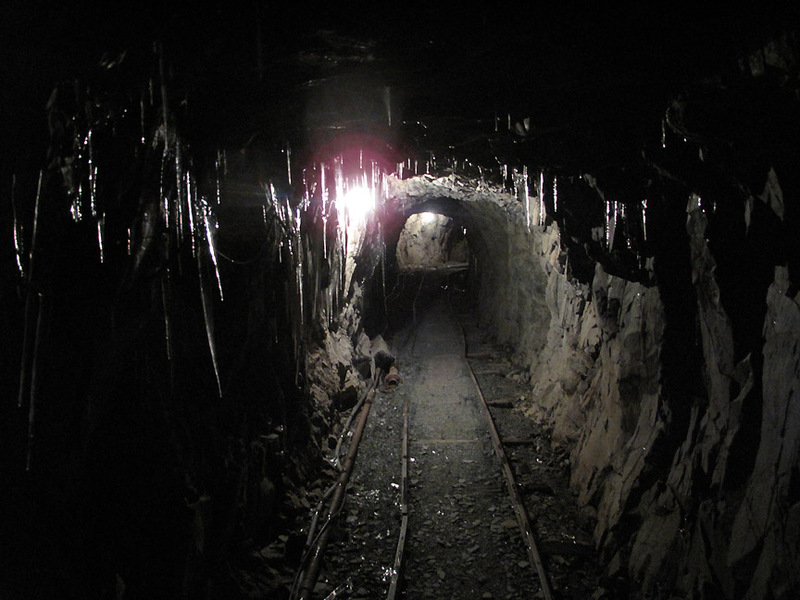 . . deep underground. 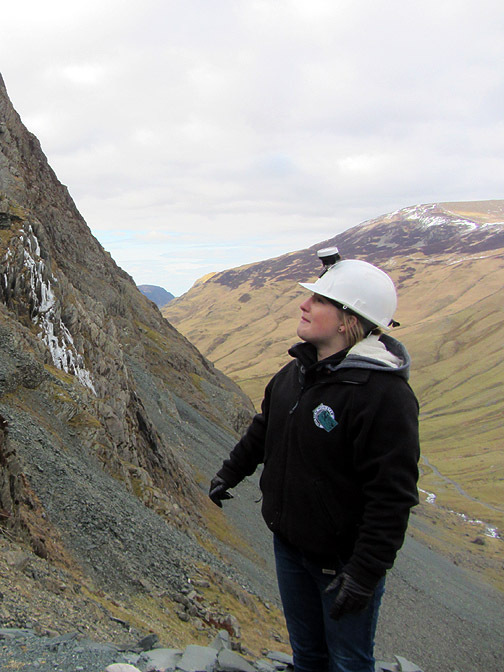 The Honister Slate deposits are trapped between inclined planes of hard volcanic rock . 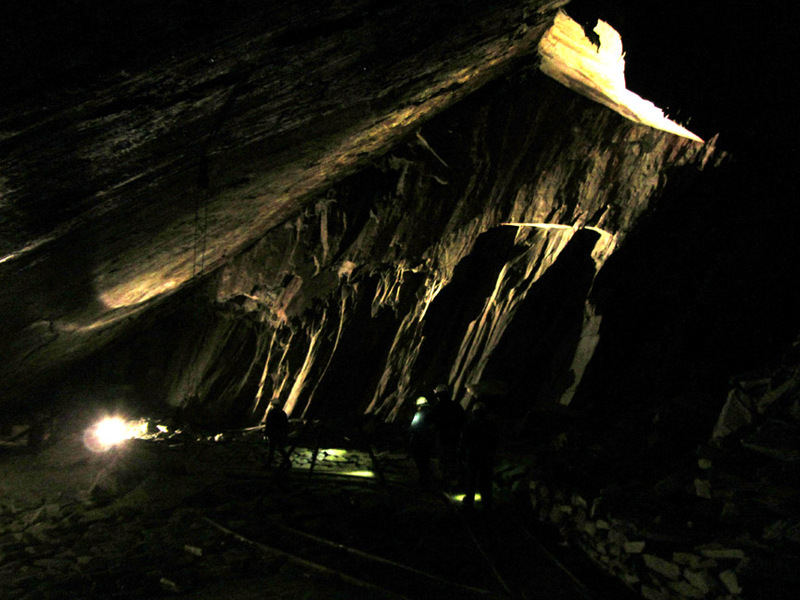 . .
here forming the sloping ceiling of the old mine workings. The base of the inclined railway . . .
. . . leading up to the higher mine levels. 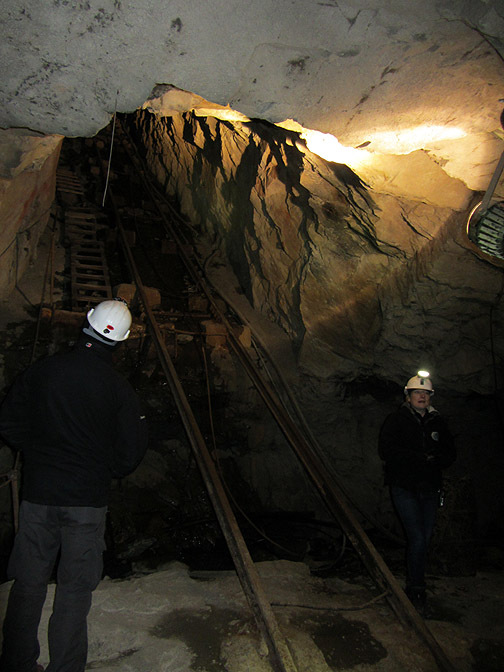 in favour if a much more practical and weather proof system of transportation of the stone down within the mine. 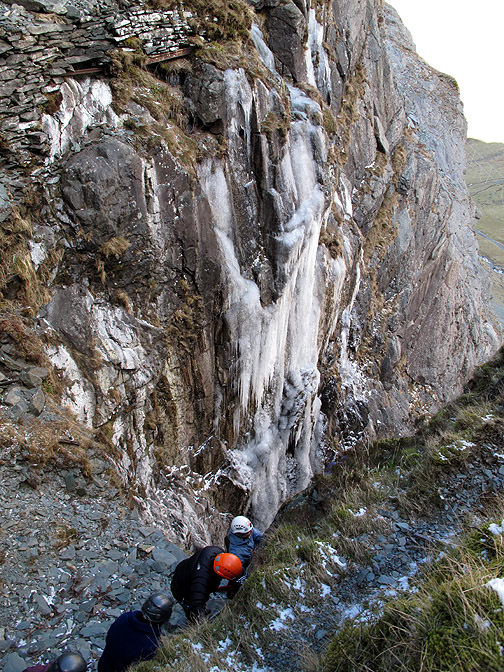 Nearing the outside once again, the cold air is transforming the dripping rock into a wonderful display of icicles. 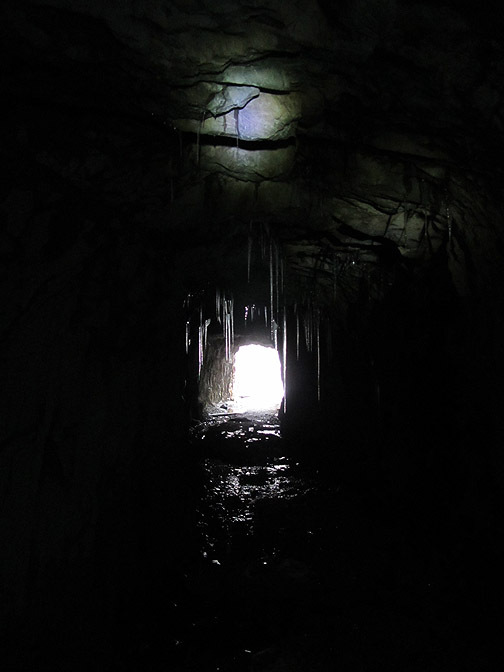 Daylight at the end of the tunnel. A big thanks to Becky for her enthusiasm and guidance. Rain or shine, inside or out, there is always plenty to do . 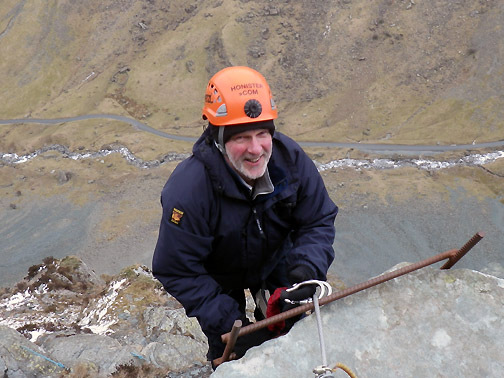 . . be it the shop or cafe, a Honister Mine Tour, the Via Ferrata or the Ferrata Extreme ! 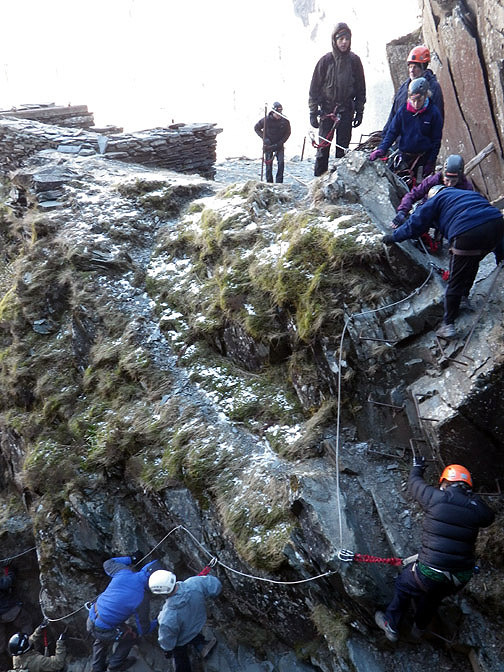 Thanks to Jo, Jan, Celia, Paul, Becky, the late Mark Weir and all the rest of the crew who made it all possible. 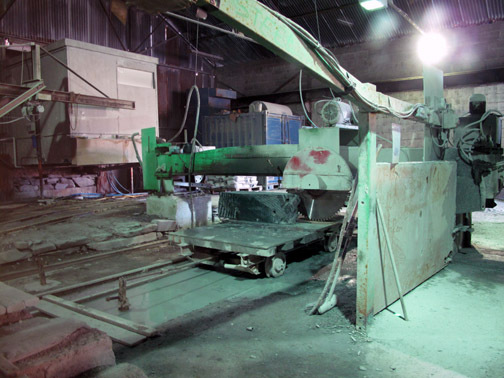 This site best viewed with . 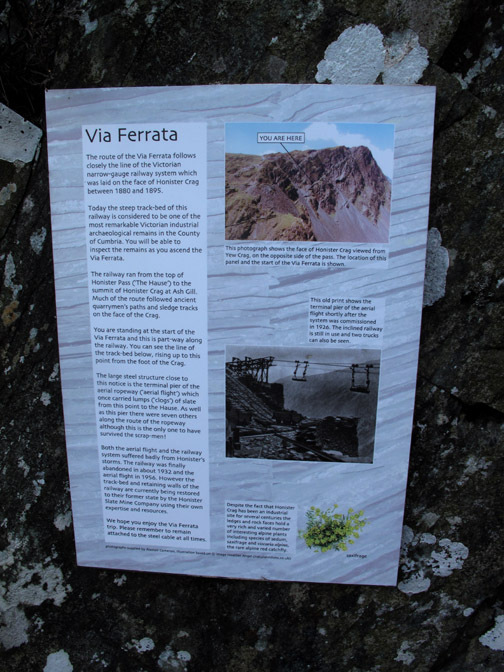 . . A great attraction on your doorstep.